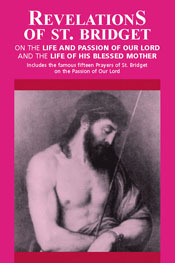 Dimensions: 4" X 6" X 0.25"
St. Bridget of Sweden was a mystic and author born in 1303 at Uppland. One of the six patron saints of Europe, she married at the early age of thirteen and bore eight children, one of whom was later canonized as St. Catherine of Sweden. She was a distinctly noble and charitable woman, earning her a wide level of popularity, and also maintained good religious influence over her husband, Ulf Gudmarsson. Bridget later founded the Order of the Holy Savior, and also experienced visions of Mary and the Christ Child. She died on the twenty-third of July, 1373, after having written various prayers and popularizing the well-known Fifteen Prayers of the Lord's wounds. St. Bridget was canonized by Pope Boniface IX in 1391.